The Apsáalooke American Indian hails from the Crow Nation Reservation near Billings, Mont., and on March 21, the MTV Iggy blog named him Artist of the Week from among hundreds of competitors. What makes him special? Well, he raps under the name "SupaMan," he sings, he makes crazy drum loops, he's a champion powwow fancy dancer and sometimes, if you're lucky, he does all four at the same time. "Native Americans grasp that culture of hip-hop because of the struggle," he says. He says he and his friends took the stories they heard in rap songs and made them real life. "We would play the part, you know. We were wannabees, trying to be, like, these rappers on the rez. Supaman says he got lucky — he was never caught breaking the law, and as his music career gained momentum, it seemed hip-hop could be his ticket to a better life. A record label in Seattle took interest in him, and Supaman started touring, leaving behind his wife and baby. On one trip he and another Native American rapper were in New Mexico, bringing down the house. Supaman stayed true to his word. 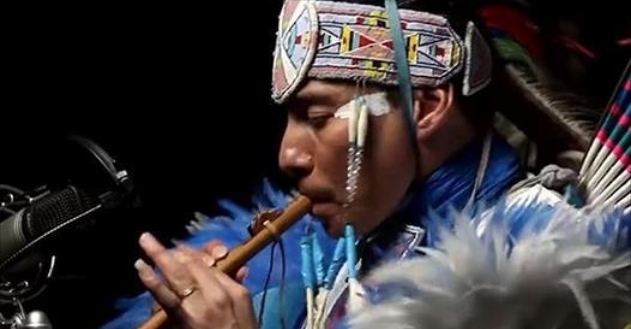 He walked away from a deal with the record label and returned to the reservation to weave a new message into his music. Responses to "Crow Nation Musician Just Became MTV's Artist of the Week"